So last time I left off in about 2006, but let me back up a bit. From 2001 to 2004 or so, life had been a struggle, three young children, a home and wife. We didn’t have much and we were happy, but it was hard. We grew stronger in our faith during that time and this is when I was able to quit some bad habits. God was using these hard times to strengthen us and teach us to trust in Him. Well in 2005, I landed that long-term contract and life was getting easier, at least financially. In February we were blessed with our fourth child, Ethan. Later that year we were able to purchase our first home. If you’re familiar with what happened between 2006 and 2008 or so, you may realize that this was probably not the best time to purchase a home, but needless to say, God had this in his timing. Things were going great, but I still had more lessons to learn. From 2006 until 2009 or so, my business was really taking off, but I wasn’t quite ready for this level of success. We didn’t spend money on frivolous things, but our bills were high so the level of income needed was high. But hey, I was making a lot of money and we were doing fine. But in hindsight, I realize that we became self-reliant, meaning I had stopped leaning on God. Oh, we still went to church, I still prayed and believed, but I stopped trusting that his grace was enough. So as often happens during times like this, God pursued me! God wants to share his blessings with us. We look back at our story about Jacob wrestling with God. God forced Jacob to wrestle. He was the initiator of the match. But why make us wrestle? Does God wish to withhold his blessings from us until we “win” them from him? Not at all. But I believe that he shares even more blessings with us through the wrestling that without. So those hard times are important, to teach us, to sharpen us, to show us how great and merciful God truly is. These are things we wouldn’t receive if the gifts were just handed to us. As many of you know, in 2008 the economy started to go into recline. Prices were rising, home values dropping, businesses were reluctant to spend money as their business slowed. Being a small consultant, I was easy to cut from the budgets of many of my clients. So work slowed down and the money stopped coming in. Remember, we had a high income need and it was slowly getting depleted. Along with that our debt started to rack up. I had my best years ever in 2006 and 2007. Such great years that I wasn’t really prepared for it. And being a small business in the United States, we often bear the burden of high taxes. Taxes I wasn’t prepared for because of my own lack of preparation. So the tax man came and I owed a lot of money to the government. Well realize, they want their money. They don’t care about anything else but getting what is due. Being someone who feels obligated to pay what I owe, we set up payment plans with the IRS to pay it down. But combine that added expense, with a slowing economy and things got real tight. See God came to Jacob. God wanted to bless Jacob and God came to him. Much the same, I feel God came to me during this down slide. During the downward spiral, I often turned inward, but God had a way of bringing me back. He would pull me out of my self-pity and forced me to wrestle with him, to see God face-to-face. Also, notice that God wrestled Jacob the entire night. God could have very easily knocked Jacob out quickly, but He kept the struggle going all night. Much the same, our struggle lasted for a few years. The darkest of times, were from 2008 until early 2011. There were times in there that we weren’t sure where we were going to get money to feed ourselves, let alone pay the bills. But over and over, God came through in so many small ways during this period. Those small blessings that you may not even notice at first, but looking back you can see they could only come from God. This struggle was real and it was long. 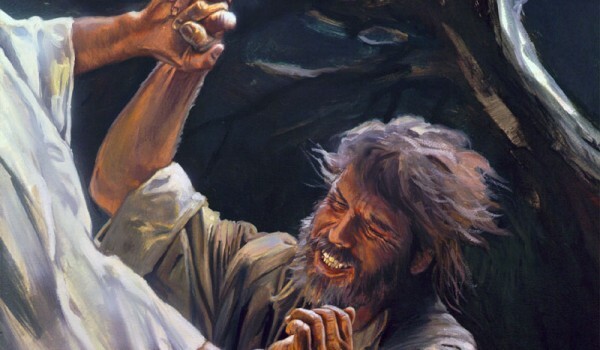 Near daybreak, God caused Jacob’s hip to be injured. Much the same, in 2010 I was injured both physically with a back issue and emotionally through the financial issues that we were facing. It was at this point that I had a choice to make. I could let go and perhaps lose the blessings that God in store for me or I could hold on until God blessed me. Luckily I made the wise choice. I held on. I could do nothing else. I had already proven, despite my best efforts, I could not “fix” things on my own. So I held on. I stood strong in my faith that God would see us through. And God blessed me. He didn’t magically remove my debt, nor did I magically discover a treasure chest of money. But despite leaving me with my “injured hip”, he blessed me. And in reality, that “injured hip” of mine was a blessing itself. 2011 found me with a new job, steady paycheck and a way to bring my family from the brink of financial disaster. I held on to God, after he had brought me low, until he blessed me. And the blessings far exceeded my expectations and they came in unexpected ways. This is not the end to this story, but that is a story for later.